Options for making a window or ductless A/C unit smarter are increasing, which could mean extra savings for a lot of people. We recently covered the Sensibo Sky and liked the options it offered, but another contender has arrived: The Tado Smart AC Control is a much more stylish unit than the Sky, and it offers some extra bells and whistles. The Tado is also $30 more expensive than the Sky, but you can buy either of them for less than the cost of a new air conditioner. A room air conditioner, in turn, can be a whole lot more economical to operate than central air if you spend most of your time in the same room. Like the Sky, the Tado’s most notable feature is its ability to control your air conditioner remotely, via your smartphone (Android, iOS, and yes, even Windows Phone). You can set one temperature for when you’re home, and another for when you’re away. An onboard motion sensor, as well as geofencing capabilities in Tado’s smartphone app, determine your presence or absence. Unlike the Sky, however, the Tado offers terrific granularity for setting temperature targets based on schedules. Tado’s app also tracks all the data it ingests. 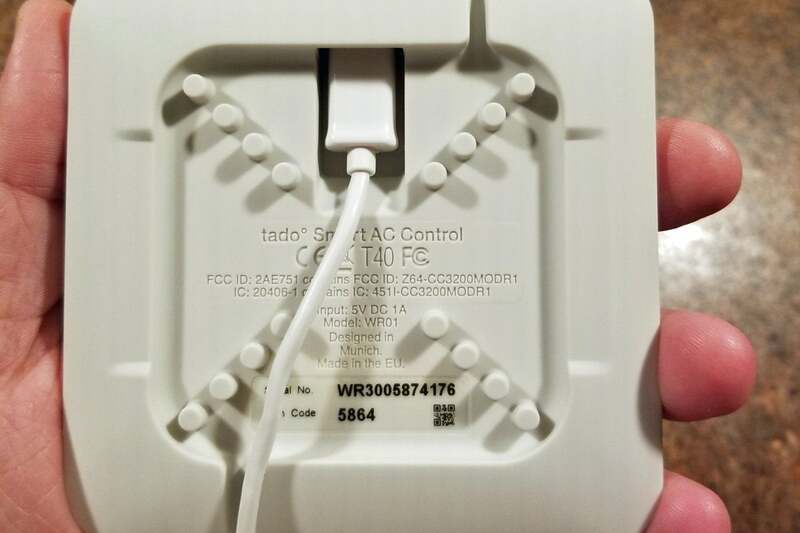 Here's a thoughtful design detail: You can wind the excess cord around these pegs for a tidy installation. Tado is much more specific than Sensibo when it comes to the type of air conditioner it can control: The Tado supports only units that have remote controls with “full state displays” that report all settings, including mode, target temperature, and fan speed. The device can be set to operate in one of two modes: Under “thermostatic” control, the factory default, it will tailor the commands it sends to the air conditioner so as to maintain room temperature withing a range of the target you set. The air conditioner will use only one fan speed in this mode, but you can change speed that by having the Tado re-learn your air-conditioner’s remote. If you decide that the A/C is turning on and off too often while trying to maintain that range, you can change it to “non-thermostatic” control. In this mode, the Tado will still send settings to the air conditioner, but it will leave it up to the air conditioner to regulate room temperature. You’ll need to contact Tado’s technical support to change from the default. The Tado app's scheduling features is top notch. 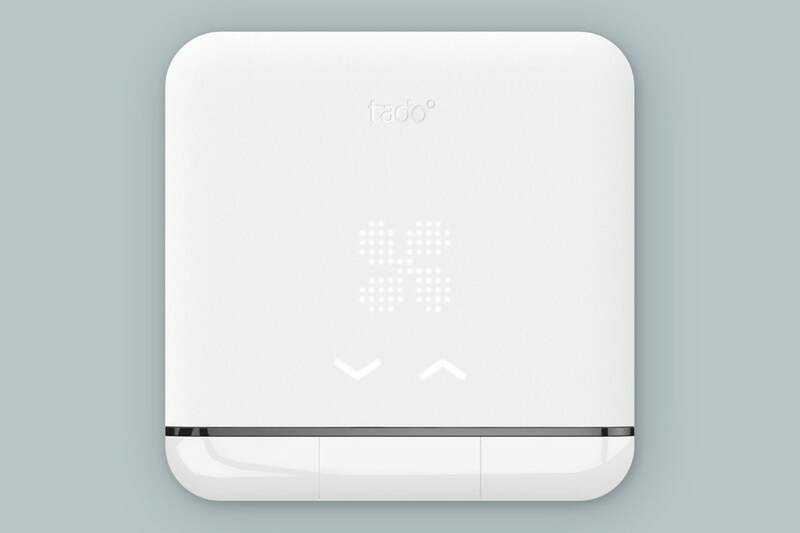 The Tado is packaged in a very thin enclosure with a low-key dot matrix display and touch-sensitive controls. I found the on-device controls a little unintuitive, but having the option to change temperature settings this way, instead of being forced to use the app every time, is very convenient. Speaking of convenience, you can also control the Tado with voice commands via an Amazon Echo or Googe Home device, and it’s IFTTT compatible. The Tado justifies its $30 price premium over the Sensibo Sky—it’s more attractive and it offers more features. But none of that will matter if your air conditioner isn’t compatible with it. 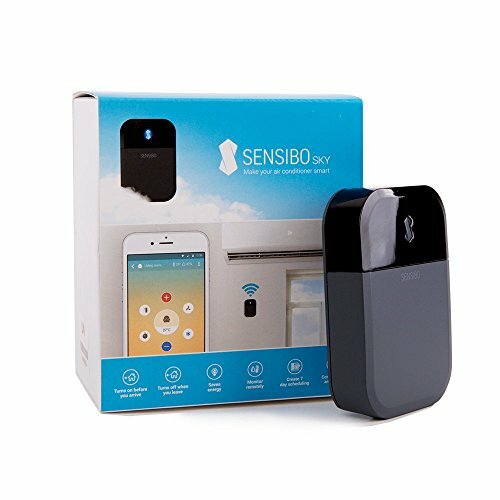 If you’re in that boat, Sensibo’s product still delivers a lot of benefits. If you have the right type of stand-alone A/C unit, this is the most feature laden and stylish way to control it.